Portobello’s beach on the north-west coast of Sardinia is something truly special: red, grainy sand is framed by rugged, rocky reefs and crystal-clear water. Not far from here, the endless dream beaches of Cala Vignola stretch 25 kilometres all the way to Capo Testa. Portobello - a beautifully peaceful village in the north of Sardinia. Portobello is an oasis of calm: the exclusive holiday resort on the northern tip of Sardinia is an amalgamation of 200 upmarket villas in a landscape conservation area. 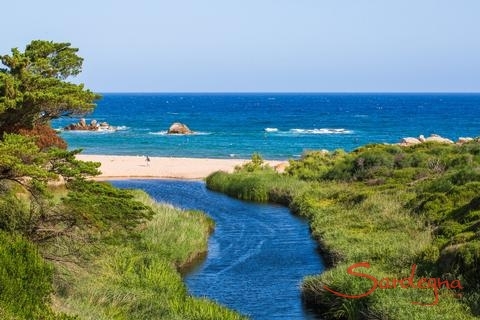 It faces Corsica and enchants with gorgeous beaches and the unspoiled nature of Gallura. The village of Aglientu is an original, slowly growing village. It all began with the church of St. Francesco of Assisi in 1776. A few years later a new church was built next to it, where festivals and trade took place. In 1850, some well-to-do families built true dwellings, which formed the core of the town centre. Today, Aglientu has almost 1,200 inhabitants and has formed a separate municipality belonging to the province of Olbia Tempio. Numerous festivals attract thousands of tourists from the coasts during the summer, such as the Seadas festival (typical dessert made with cheese and honey) on the last Saturday in June, or the sausage and cheese festival on the 12th of August. Granite outcrops and rugged coasts are characteristic of the area. Santa Teresa di Gallura is nestled within these features. From here the ferries leave for Corsica, which can be reached in just 45 minutes. A stroll through the old town is worthwhile. From here you come to the rocky outcrop in the sea, where the Longosardo tower was built in the 16th century, during the time of the Aragonese. From here you have a great view from the bay of Porto Longone to the bright rocks of the Corsican city of Bonifacio. The beaches of Portobello are characterized by coarse, pink-coloured sand and rocks. There are a few charming little bays; in some it is good to have plastic sandals to protect your feet when going into the water. To reach the beach, drive towards Portobello Mare and take the gravel road to the car park (a parking fee applies). The beach is then one hundred metres on foot. Located directly in Vignola Mare, just behind the holiday homes. This beach slopes extremely gently to the sea and is therefore ideal for children. An isolated, coarse sandy beach. Its name comes from the small river Riu Li Saldi, which empties here. A small pine forest offers excellent refuge from the hot midday sun. Follow the SP 90 eastwards from Vignola Mare for approximately 2 km, then turn left towards the beach. A magnificent small sandy beach, surrounded by pink rocks. There is a car park directly beside the beach. Take the SP 90 from Portobello towards Costa Paradiso. In Stazzu Lu Becciu, turn towards the sea and follow the road for approximately 2 km. This idyllic beach is framed by lush sand dunes. The impressive waves make the beach a firm favourite amongst bodysurfers. From Portobello, take the SP 90 eastwards for approx. 9.5 km, then turn left onto the gravel road leading to the beach. 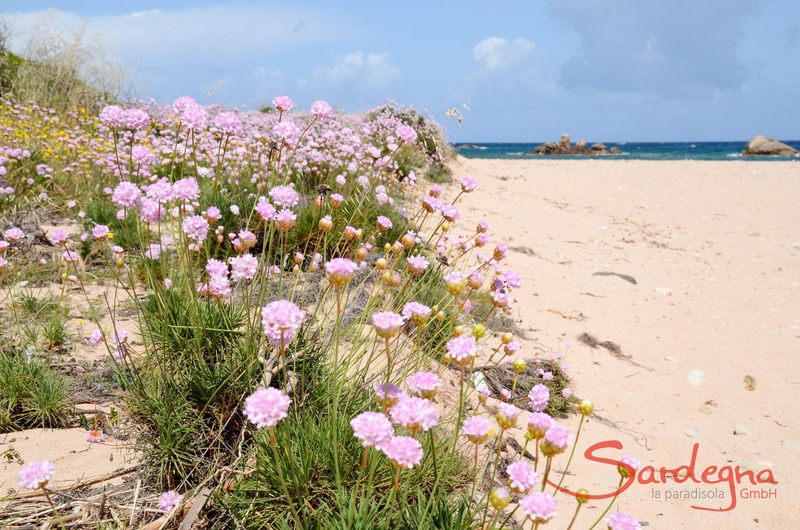 This coarse sandy beach is enveloped by lush Mediterranean vegetation and pink rocks. Take the SP 90 towards Santa Teresa, then follow the signs to the beach. 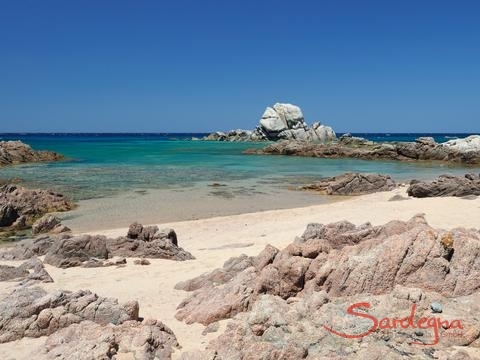 This stunning beach is even known beyond the borders of Sardinia. Its situation between high rock faces and a small lake give it a magical atmosphere. The crystal-clear water makes it a paradise for diving enthusiasts. The beach is at the end of the village of Costa Paradiso. There you park and walk the last hundred meters over a narrow footpath to the bay. A splendid beach stretching kilometres and surrounded by golden dunes. Located on the road leading eastwards towards Capo Testa. Even in the height of summer this beach, with its turquoise water, remains an idyllic, well-kept secret. A breathtaking, secluded sandy beach at the mouth of the Rio Pirastru. The beach can be accessed via the SP 90. Follow the road westwards until just before Isola Rossa. Take the road leading right towards the hotel Tinnari: follow the gravel road to the car park. A footpath leads to the bay (approximately 1 km). The Tinnari and Li Cossi beaches are linked via a footpath. 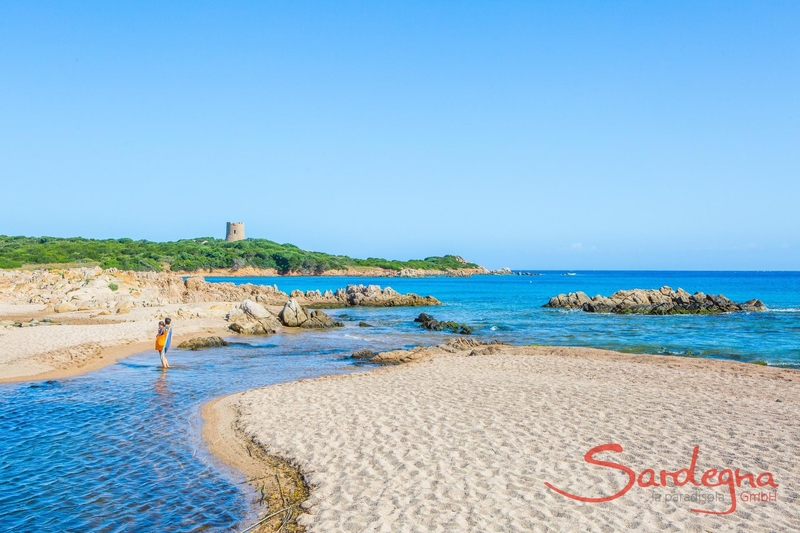 This beautiful, wide sandy beach is a popular place to bathe in the small village of Isola Rossa. Upon entering the village, turn left directly after Hotel Marinedda and follow the road for the few hundred kilometres to the beach. Beach umbrellas, loungers, pedal and motorboats can be hired here. It is a popular beach for windsurfing. 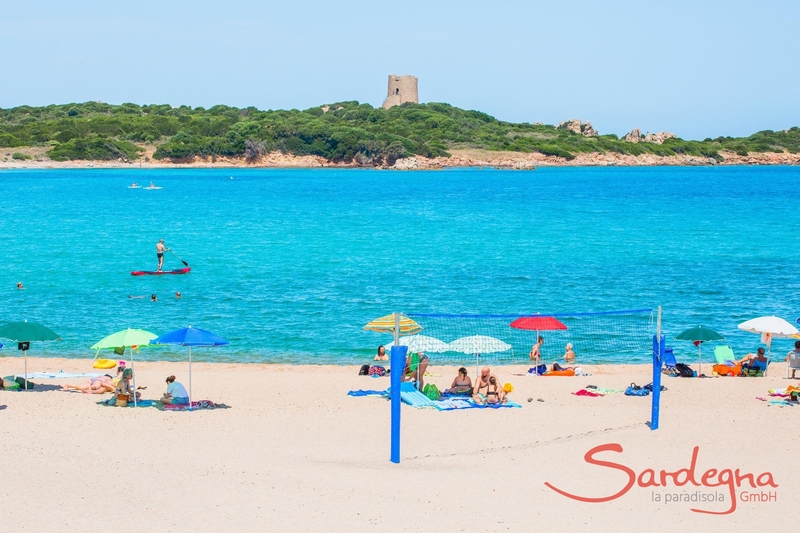 The beach is situated at the northern end of the small harbour town of Santa Teresa di Gallura. On a clear day, it is possible to see houses in the town of Bonifacio in Corsica. A stone’s throw from the beach, visitors can contemplate the Spanish watchtower, Torre Longosardo. In front of the village of Badesi is a 7 km long white sand beach. The beach, depending on where you are, has different characteristics and each stretch of beach has its own name. 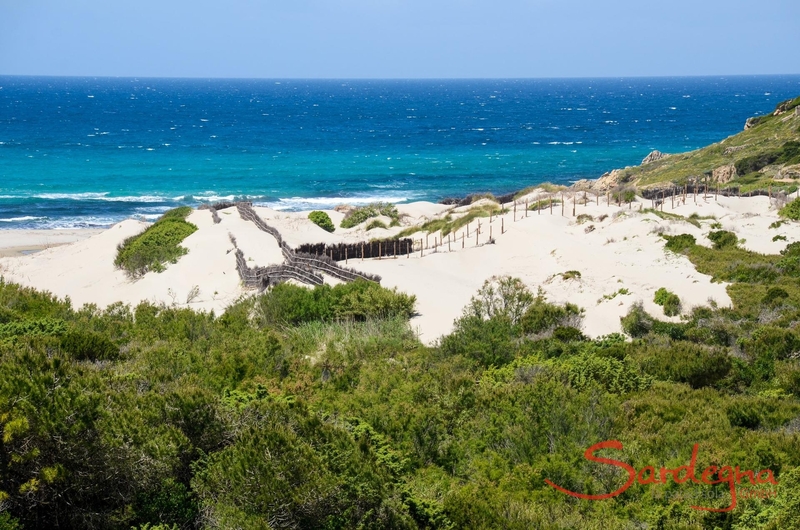 From the north to the south, these are: Li Junchi: this part of the beach measures 1.6 km and is very well equipped with bars, beach rental, surf and kite surfing schools. The next section is Li Mindi, which extends over several kilometres and is rather natural. It is also visited in summer and is recommended for those who like peace and quiet. The following 500 metre stretch is called Poltu Biancu, and continues to be natural and quiet. Then comes Baia delle Mimose, named after the resort of the same name, just behind the beach. The next part of the beach, Valledoria belongs to the municipality of Sassari and is a kind of sand island that has formed between the sea and the mouth of the Coghinas river. If you come from the place Valledoria, you have to take a small ferry to the beach. 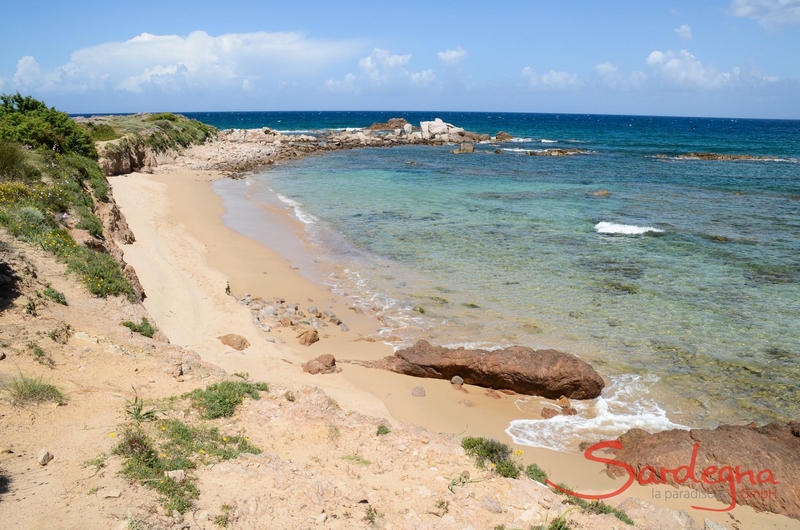 The last part of the beach is the San Pietro beach, where you can visit a small church. A must for any windsurfer, the beaches of Porto Pollo (also called Porto Puddu) and Porto Liscia Sciumara are separated from each other by a small peninsula (Isola dei Gabbiani) and can be found between Palau and Santa Teresa Gallura. Apart from full surfing kit, beach umbrellas, sun loungers, pedal boats and rubber dinghies can also be hired here. There are also various restaurants and beach bars. To get here take the SS 133. The way to the beaches is well signposted. A high point of the scenically delightful Capo Testa peninsula is the Valle della Luna. The strange geological formations take visitors to a lunar landscape of impressive beauty. In the 1970s, the valley was a well-known hippy colony, and up until quite recently, many dropouts still lived in the great many cool caves in the valley. Day trips from S. Teresa di Gallura to Bonifacio are offered. Several times a day small ferries cross the sea between S. Teresa di Gallura and Bonifacio, a small historic town on Corsica. The crossing only takes 45 minutes, and the neighbouring island of Corsica is well worth a visit. The old town, which is surrounded by a fortified wall, is situated on the dizzying heights of a brilliant white, rocky crag. This can be clearly seen from Sardinia on a good day. Agriturismo near the exit from Portobello. This establishment offers a rich four-course menu based on traditional Gallurese dishes using home-grown products served in rustic surroundings. This agriturismo is situated on the coastal road from Santa Teresa di Gallura to Castelsardo, right between Portobello and Vignola Mare. Mouth-watering local delicacies made from home-grown produce. Get to know the fabulous Costa Smeralda countryside by bike. Gallura Bike Point, the active holiday specialists, bring top-quality mountain bikes from Scott, Quantec or Stevens directly to your front door. It is best to book before travel commencement. Here, sport lovers can learn to sail, windsurf and kite board, or simply hire a yawl or catamaran for individual use, in addition to a variety of surfboards, kites and much more. Various sized motorboats are also available for hire. The restaurant in the complex of Portobello itself is not exactly cheap, but definitely worthwhile. It is distinguished by its location and its exceptional gourmet offers. Restaurant with terrace and view of the sea, which serves high-quality Sardinian fish and pasta specialties, located approximately 500m from Portobello. An absolute must is the Sardinian shepherd’s soup called Zuppa Gallurese, a type of casserole with different kinds of meat, grated sheep's cheese, bread and tomato sauce. A friendly pizzeria in the centre of Aglientu. Situated in a building surrounded by large granite stones, this restaurant offers a wide range of dishes typical of the Gallura region. Meat and wines, as well as pasta dishes from their own production are still prepared and served according to traditional recipes. You can get fresh bread here every day. The market is well signposted and easy to find in Portobello.. This small grocery store in Vignola is also easy to find. Simply follow the signs for it in Vignola. Situated in the centre of the Costa Paradiso holiday resort. Nearest shopping centre with a full range of products. Coming from the direction of Vignola and Portobello it is at the entrance of S. Teresa di Gallura on the left side. A well-stocked supermarket with a wide range of products. Windsurfing, kitesurfing, sailing: lessons and rental, boat excursions, a beach bar and great beach parties. Everything for an active holiday at the sea can be found here. Here you can take lessons or take part in excursions on horse back. The riding centre is right next to the road leading into Santa Teresa di Gallura, to the north of the Costa Smeralda. We recommend ringing them beforehand. Before you enter Villa Massimo, you will smell the tart scent of Sardinian macchia. Its architecture in perfect harmony with the landscape and its extraordinary location near the sea at Portobello on Sardinia's north coast on a property surrounded by native evergreen plants make the Villa quite special indeed. The Villa has two bedrooms and two baths. The semi-detached house features a tasteful design that has been achieved with simple stylistic features. The living room with its white ceramic floor is bright and welcoming, and indoors and outdoors, the rough sea and the protected interior, are joined by a large sliding door. Villa Marco is well suited not only for families with children, but also for a combined stay of two couples who are friends. The kitchen is roomy and well equipped. Of course there is a dishwasher and a washing machine. The garden is left in its natural state. The property of the Villa ends in a small bay, where even in mid-summer there are few visitors, and it features a view of the cliffs "Su Culumbu," the landmark of this stretch of Portobello’s coast. Enjoy the video of Villa Massimo. 18 km away from Santa Teresa, a picturesque fishing village on the north coast across from Corsica. Portobello is a "condominium", an association of villas created roughly 20 years ago. About 200 Villas were constructed in a natural reserve with very strict requirements.&nbsp; Only authorized persons have access to the condominium.&nbsp; This has meant that very prominent guests who wish to spend their vacation in a shielded environment are comfortable in Portobello. In Portobello there is a restaurant that is open throughout the year and a supermarket. An ample infrastructure of restaurants and shopping options can be found in Vignola (5 km) and Santa Teresa di Gallura (18 km).&nbsp; Guests can reach Olbia, the Costa Smeralda and PortoTorres in one hour by car. Destination for day-trippers "Santa Teresa di Gallura", 26 km. Villa Massimo – a captivating vacation house on the seafrontBefore you enter Villa Massimo, you will smell the tart scent of Sardinian macchia. 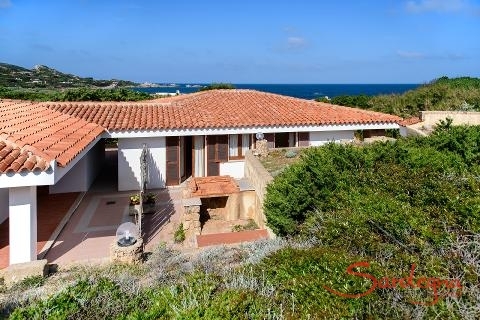 Its architecture in perfect harmony with the landscape and its extraordinary location near the sea at Portobello on Sardinia's north coast on a property surrounded by native evergreen plants make the Villa quite special indeed. The Villa has two bedrooms and two baths.The semi-detached house features a tasteful design that has been achieved with simple stylistic features. The living room with its white ceramic floor is bright and welcoming, and indoors and outdoors, the rough sea and the protected interior, are joined by a large sliding door. Villa Marco is well suited not only for families with children, but also for a combined stay of two couples who are friends. The kitchen is roomy and well equipped. Of course there is a dishwasher and a washing machine. The garden is left in its natural state. The property of the Villa ends in a small bay, where even in mid-summer there are few visitors, and it features a view of the cliffs "Su Culumbu," the landmark of this stretch of Portobello’s coast.Enjoy the video of Villa Massimo.Villa Massimo is located in Portobello,18 km away from Santa Teresa, a picturesque fishing village on the north coast across from Corsica. Portobello is a "condominium", an association of villas created roughly 20 years ago. About 200 Villas were constructed in a natural reserve with very strict requirements.&nbsp; Only authorized persons have access to the condominium.&nbsp; This has meant that very prominent guests who wish to spend their vacation in a shielded environment are comfortable in Portobello. In Portobello there is a restaurant that is open throughout the year and a supermarket. 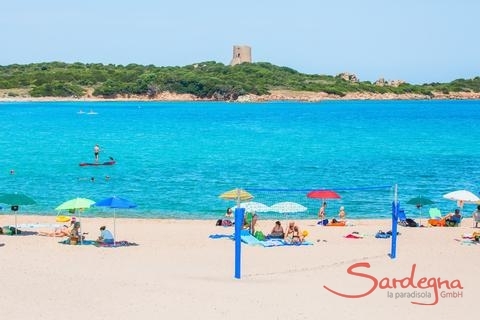 An ample infrastructure of restaurants and shopping options can be found in Vignola (5 km) and Santa Teresa di Gallura (18 km).&nbsp; Guests can reach Olbia, the Costa Smeralda and PortoTorres in one hour by car. Click here to load Google Maps. A holiday house with a beautiful sea view. Villa Mirto is located across from Corsica, and 10 miles from Santa Teresa di Gallura. Villa Timu - a holiday house set on a small sandy inlet. The villa belongs to Portobello, part of a scenic fisching village on the north coast of Sardinia. 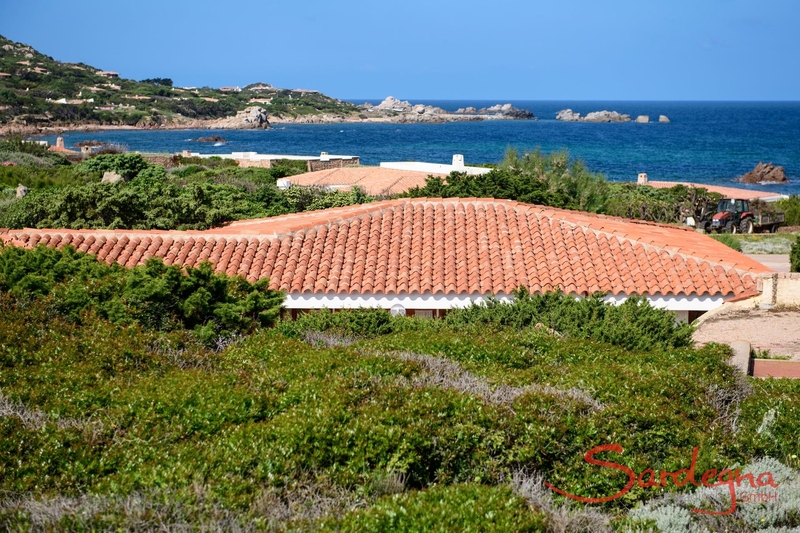 It is located across from Corsica an 10 miles from Santa Teresa di Gallura. From here, it's about an hour to Olbia, la Costa Smeralda and Porto Torres.